Sridevi's mortal remains consigned to flames. The funeral procession started at 2 pm. 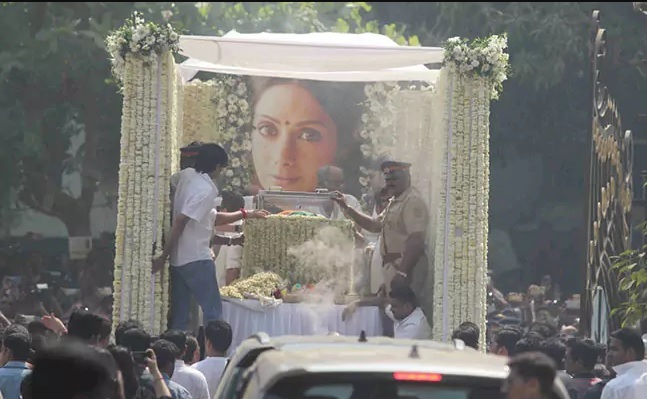 Sridevi's mortal remains consigned to flames. The funeral procession started at 2 pm from the Celebration Sports Club where a prayer meeting was organised. A decorated truck is carrying the iconic actor's mortal remains to the Vile Parle's crematorium, where the final rites and cremation was held. Hundreds of emotional fans gathered outside the club to catch one last glimpse of their beloved actress. Fans holding flowers in their hands and chanting prayers were seen as the body of the actor was brought to the venue along with an entourage of family members. The gates of the club opened after 10 am for the general public but fans from across the country started gathering during the wee hours of this morning to pay their last respects to the beloved star. While Salman Khan was one of the firsts to visit Lokhandwala residence of the late actress, film-maker Karan Johar was the first among personalities to arrive at the Celebration Club to pay last respects in the morning, followed by others celebrities like Aishwarya Rai, Sushmita Sen, Jaya Bachchan, Sanjay Leela Bhansali, Shweta Bachchan, Hema Malini, Arbaaz Khan and Farah Khan. Sridevi, known as Indian cinema's first woman superstar, is survived by her husband Boney Kapoor and their two daughters Jahnvi and Khushi. While mediapersons are not allowed inside with equipments, the family said media persons can pay their respects "provided camera, recording devices, etc are left outside the venue". Sridevi was in Dubai to attend her nephew Mohit Marwah’s wedding. She was found unconscious in a bathtub in her hotel room by husband Boney Kapoor on Saturday evening. After completing the probe, Dubai police handed over the mortal remains of Sridevi Boney Kapoor to her husband and stepson Arjun Kapoor on Tuesday. Her body was brought to India late night on Tuesday. Inside the prayer hall, Sridevi's body was kept wrapped in a red saree with full 'shringar' of that of a married woman. Arjun Kapoor personally thanked everyone for coming. ​Sonam Kapoor stood close to Sridevi's body. Earlier, hundreds of fans had gathered outside the Kapoor residence in Lokhandwala as the ambulance carrying the mortal remains of the actress arrived from airport. Sridevi was celebrated as the first female superstar of India, who was paid more than her male counterparts in movies. Dubai authorities took three days to complete the formalities.  Indian Ambassador to the UAE Navdeep Suri said to a news channel that they functioned closely with the authorities to have the process completed as soon as possible. He also told that the devastation and grief was very visible in the Kapoor family. The forensic report claimed that Sridevi died due to accidental drowning following loss of consciousness. The case was closed by Dubai police on Tuesday, suspecting no foul play. Boney Kapoor was joined by his son Arjun Kapoor on Tuesday. His nephew Saurabh Malhotra waited outside the morgue and accompanied Sridevi’s body to the embalming centre. Sridevi’s daughters Janhvi Kapoor and Khushi Kapoor were in Mumbai when Sridevi breathed her last. Currently, they are residing at Anil Kapoor’s place with Sonam Kapoor and Anshula Kapoor. Sridevi was accompanied by her younger daughter Khushi Kapoor and husband Boney Kapoor to Mohit Marwah’s wedding in Dubai. However, Boney Kapoor and Khushi flew back to India on Tuesday while Sridevi stayed back. Boney Kapoor returned to Dubai on Saturday to surprise his wife. The couple planned to go out for dinner before Sridevi allegedly collapsed in the bathroom. Sridevi’s film career spanned for 50 years. She started working from a tender age of 4. She acted in Tamil, Telugu, Kannada and Malayalam movies before foraying into Bollywood. The actress last retweeted a tribute performance on her account less than 24 hours before her death. Sridevi took a sabbatical from films post the birth of her daughters Janhvi Kapoor and Khushi Kapoor. In 2012, she made a power-packed comeback with Gauri Shinde’s English Vinglish. Later she acted in crime-thriller movie Mom, which released only last year. Her last appearance onscreen would be in a special appearance in Shah Rukh Khan-starrer Zero. Previous StoryLet Her Rest In Peace: Bollywood celebrities tweet pleading social media NOT to speculate on Sridevi’s death Next StorySridevi’s childhood friend reveals heartrending details of her last meeting with her!